Trumpetings is the Society's member newsletter which we issue three times per year. It contains articles and updates from across the continent to keep you informed about the latest developments and progress your gifts support. Now you can read the back issues online. You'll always know where to find it! 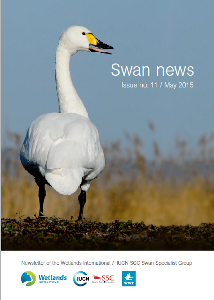 Trumpeter Swans on 2016-2017 Federal Duck Stamp; 2015 North American Swan Survey update; Nine cygnets released in Oregon; Partnerships continue in Washington and British Columbia; Ontario swans face winter habitat threat; Buried power line saves swans in Idaho; Trumpeter Watch needs your help; Yukon has new swan nesting site. TTSS hires new staff member Becky Abel; Highlight of the 22nd Trumpeter Swan Society Conference in Montana; TTSS recognizes George Melendez Wright; Trumpeter Swan 2010 Survey results; George Melendez Wright Awards honor Harold Burgess, Jim King and Harry Lumsden; Trumpeter Watch Update; 1% for the Planet; Matching funds for this year's Membership Drive and Annual Appeal. TTSS 2nd Conferences news and registration; Seney National Wildlife Refuge profile; National Park Service Trumpeter meeting and Greater Yellowstone Initiative; Dale Becker reports from the Flathead (Montana); The Blackfoot Challenge by Greg Neudecker; Board updates; Artists for Conservation; Adopt a Swan; The passing of some very good friends. 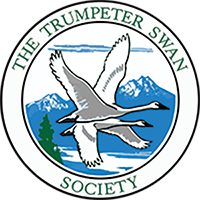 Society News; Announcing the 22nd Trumpeter Swan Conference in Montana; Updates from Kenai NWR (Alaska), Squaw Creek NWR (Missouri), Yukon, Au Sable River (Michigan); Yellowstone updates; Tribute to Carl Mitchell, retiring; Montana's progress on the Flathead Indian Reservation; Issues with lead; Iowa restoration update; Trumpeter Watch and more.